Hawaii's Matt Gibson tried to pass against Fresno State's Tyson Parker in the first half. Hawaii rediscovered its stroke from the beyond the arc to close its homestand with a 75-62 win over Fresno State last night at the Stan Sheriff Center. The Rainbow Warriors (7-10, 2-3 Western Athletic Conference) had made just six of 35 3-point attempts in the first two games of their homestand, and were 2-for-7 in the first half last night. But they heated up after the break to hit seven to pull away from the Bulldogs (9-10, 2-3). Jared Dillinger broke out of a shooting slump to lead four Hawaii players in double figures with 15 points. Bobby Nash finished with 13. Riley Luettgerodt had 12, as did Matt Gibson, who scored all of his points in the second half. Fresno State, meanwhile, struggled from long range for the second time in an 0-2 road trip, going 5-for-20 from long range. Kevin Bell led the Bulldogs with a game-high 21 points. The Rainbows leave tomorrow on a road trip to Boise State and Idaho. Hawaii turned the tables on a Fresno State team known for its 3-point prowess to close its homestand with a 75-62 win over the Bulldogs last night. The Rainbow Warriors had made just six of 35 3-pointers in their last two games, but drained seven in the second half last night to pull away from the Bulldogs and post back-to-back wins for the first time this season. "Tonight was just one of those good nights where things were really clicking," UH coach Bob Nash said. The Rainbows improved to 7-10 overall and 3-2 in the Western Athletic Conference with their fifth victory over Fresno State (9-10, 2-3) in the last six meetings. A crowd of 5,447 at the Stan Sheriff Center -- the largest of the season -- saw senior Jared Dillinger break out of a shooting slump to go 6-for-9 from the field with three 3-pointers to lead four UH players in double figures with 15 points. He entered the game having missed his last six attempts from beyond the arc. "You just have to shoot when you're in a slump like that," Dillinger said. "Everyone was feeling it tonight and we were all just feeding off of each other." Dillinger also turned in a solid defensive performance, hounding Fresno State sharpshooter Eddie Miller into a 1-for-9 shooting night. Bobby Nash dropped in three treys in a row in a second-half outburst as Hawaii opened up a double-digit lead. Nash finished with 13 points. Riley Luettgerodt had 12 points and a team-high six rebounds. Matt Gibson, held scoreless in the first half, hit for 12 points in the second half as the Rainbows shot 61.5 percent from the field. Jared Dillinger of Hawaii drove past Eddie Miller of Fresno State last night. Dillinger scored a team-high 15 points. Nash and Gibson both dished out eight assists to account for the bulk of the Rainbows' 20 and the team committed a season-low five turnovers. "We really shared the basketball. Any time we get 20 assists to five turnovers and guys are really looking for each other, I thought that was a big key," Bob Nash said. "We did everything within the framework of the offense." Fresno State point guard Kevin Bell drove through the Hawaii defense for a game-high 21 points. But Miller scored just two points and missed all five 3-point shots. He entered the game shooting 41 percent on 3-pointers, and had hit a team-high 61 treys. The Bulldogs, the WAC's most prolific 3-point shooting team, collectively went 5-for-20 from beyond the arc. "I'm sure our tired legs have something to do with being a step slow, but give Hawaii credit for executing the second half and making shots," Fresno State coach Steve Cleveland said. "They controlled the tempo of the game offensively the last 15 minutes, and once they got the lead we didn't have the legs or energy really to be what we needed to be." There were three ties and 12 lead changes in a tight first half until a spark from the platoon system sent the Rainbows to a lead they wouldn't relinquish. Trailing 18-15, Nash subbed in the unit of Kareem Nitoto, Bobby Nash, Adhar Mayen, Paul Campbell and Alex Veit, and the group delivered an 8-0 run. Nitoto started the spurt with his first 3-pointer of the season, getting a shot from the right wing to bounce high off the rim and drop through the net. "They came with a lot of energy," Bob Nash said. 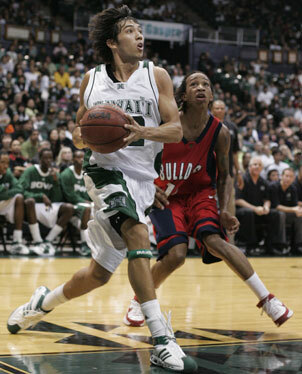 UH led 29-23 at halftime and broke the game open when Bobby Nash went on his 3-point spree. Gibson followed with another to give UH a 50-38 advantage. "It's just one of those things, when you hit one and you go back and take another one," Bobby Nash said. "If it goes in, you go back and take another one. I was just hot, I got cooled off the fourth one, but Matt carried it and hit one." The Rainbows leave tomorrow on a road trip to Idaho. They face Boise State (13-5, 4-2) on Thursday and Idaho (4-13, 1-5) on Saturday. 3-point goals -- Fresno St. 5-20 (Hernandez 2-7, Bell 1-3, Miller 0-5, Parker 1-3, Golubovic 1-2), Hawaii 9-18 (Luettgerodt 0-1, Nash 3-6, Gibson 2-5, Dillinger 3-5, Nitoto 1-1). Personal fouls -- Fresno State 14, Hawaii 13. Steals --Fresno St. 1 (Miller), Hawaii 5 (Nash 3, Gibson, Dillinger). Blocked shots -- Fresno St. 2 (Blair, Webster), Hawaii 5 (Owsley 2, Nash, Gibson, Campbell). Turnovers -- Fresno St. 11 (Miller 4, Bell 3, Parker 2, Golubovic, Webster), Hawaii 5 (Nash 2, Luettgerodt, Gibson, Dillinger). Officials -- Bill Kennedy, Ronnie Hernandez, Kevin Brill. A-- 5,447.